It’s a formidable distance, but she did it. She ran her first hundred. Jen Duncan has been ramping up her training for months now. She’s meticulous about her running: keeping logs, knowing the day-by-day training she’ll do well in advance, sticking to her plans, preparing the right food and hydration intake, getting out for night runs at a certain distance, and practicing running exhausted. She’s a planner. But there’s really nothing that can fully prepare you for race day when you’re going for a hundred. Michelle saw off her runner at the start, learned to use the tracking system to keep a pulse on Jen and when she was coming into Javelina Headquarters, and utilized the aid station volunteers to help her in the fast minutes that go by when she had to juggle getting a coke, soup, filling Jen’s hydration vest bladder, opening Jen’s drop bag and getting out the right clothes, and tracking Jen’s time. She texted 100 mile endurance junkies back home in Ohio to ask for tips during the race depending on how Jen was responding. She was invested in the race just as much if not more than her sister. Hearing the news that Jen finished, her coach and other local hundred mile runners reflected on their first hundred. “Your first 100 finish is like your first marathon finish. You will never forget it no matter how much time passes,” Connie Gardner said while thinking back to Mohican 100 and her first Columbus Marathon. Now that Jen has the buckle, we expect her to say “at least it’s not a hundred” at every track practice. Congratulations, Jen and Michelle. In other Wicked Runner news, Adrienna Frazer went sub 2:00 in the EVL Halloween Half Marathon in Ellicottville, NY, which entitled her to a wonderful spread of prosecco, beer and bourbon. In what may be the last Run With Scissors event in the Cuyahoga Valley National Park, Ann Wehener and Emily Collins took on a muddy trail double marathon on Saturday. Ann called it a race to finish, which she did with no problem. And Emily spent lots of energy over the course of 52 miles trying to find one positive thing going on in life, but managed a second place overall finish at a local, epic event. She didn’t have to look far to find the positive. 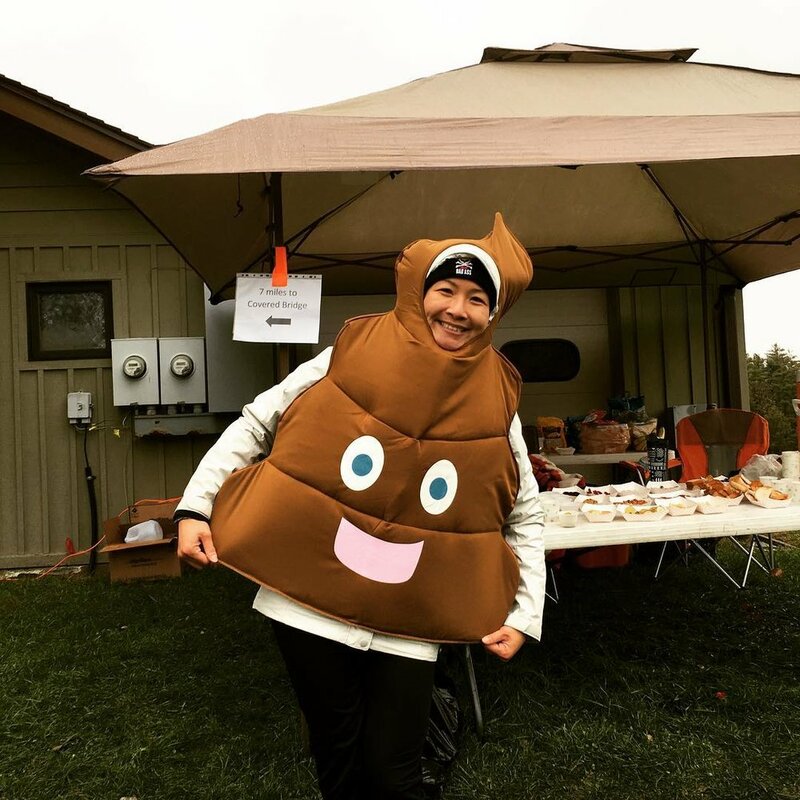 It was clearly at Sydney’s poop emoji aid station at Oak Hill.